Cbet nr. 3238, issued on 2012, September 24, announces the discovery of a new comet (discovery magnitude 18.8) by Vitali Nevski (Vitebsk, Belarus) and Artyom Novichonok (Kondopoga, Russia) on CCD images obtained on Sept. 21.06 UT with a 0.4-m f/3 Santel reflector of the International Scientific Optical Network (ISON) near Kislovodsk, Russia. The new comet has been designated C/2012 S1 (ISON). 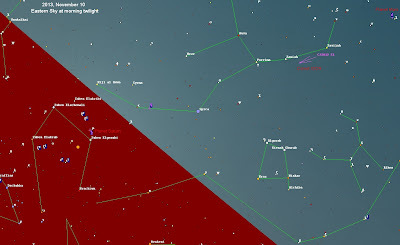 Comet C/2012 S1 (ISON) will get to within 0.012AU of the Sun (extremely close) at the end of November 2013 and then to ~0.4AU from Earth at the beginning of January 2014! According to its orbit, this comet might become a naked-eye object in the period November 2013 - January 2014. And it might reach a negative magnitude at the end of November 2013. We performed some follow-up measurements of this object, while it was still on the neocp. 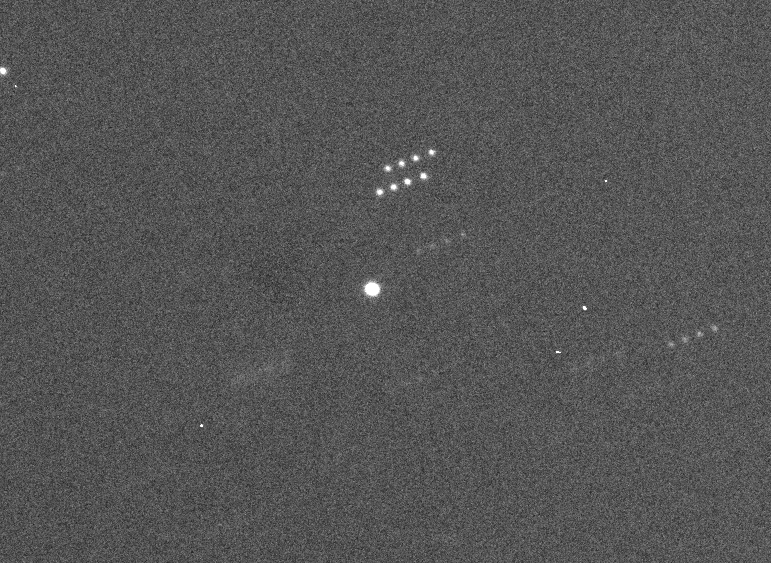 Stacking of 24 unfiltered exposures, 120-sec each, obtained remotely on 2012, September 22.4 from H06 (ITelescope network near Mayhill, NM) through a 0.25-m, f/3.4 reflector + CCD, shows that this object is slightly diffused, with a 5" coma. 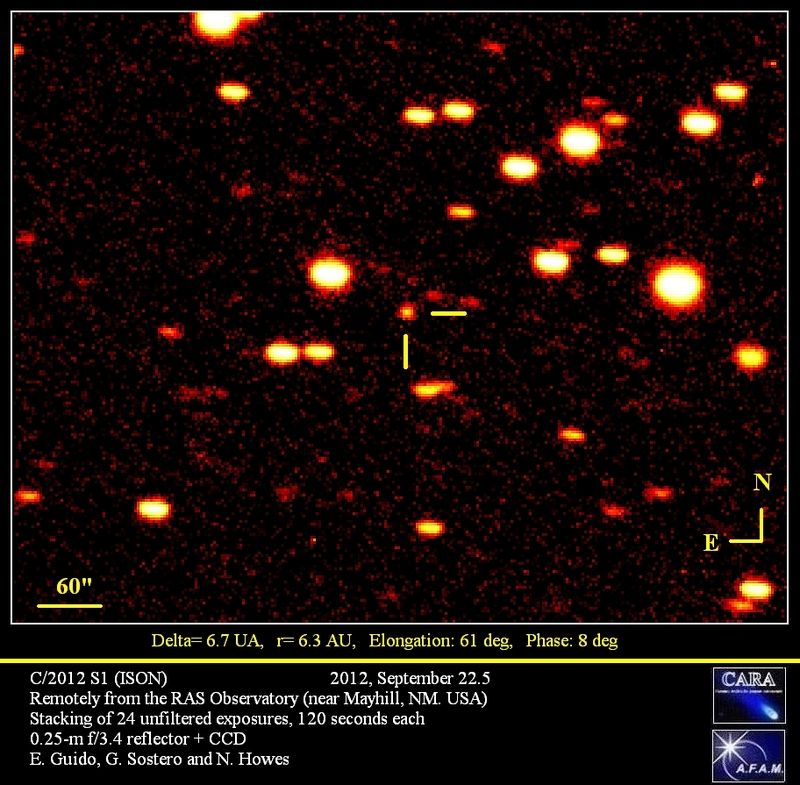 The FWHM of this object was measured about 15% wider than that of nearby field stars of similar brightness. Below you can see the orbit (Credit JPL) and current position of comet C/2012 S1 (ISON). 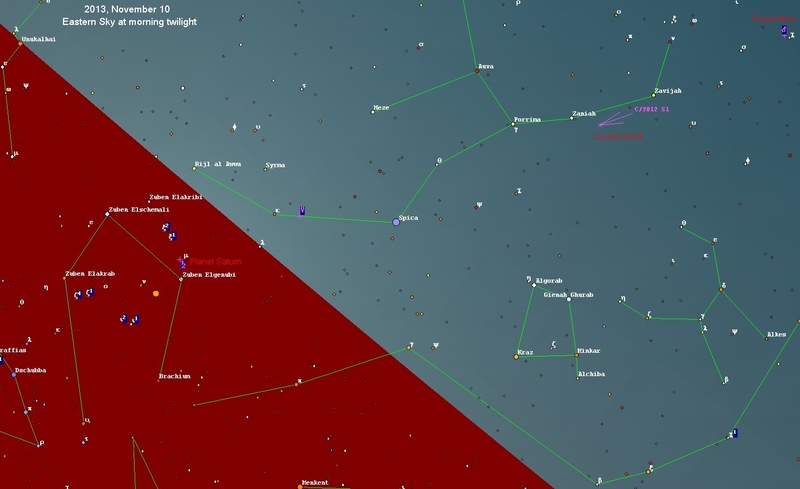 The comet is at present of magnitude ~18 and it is located at 6.25 AU from the Sun. While by clicking here, you'll see a daily animation from 2013, Nov. 10 to Nov. 25 (wait a few seconds for the video to load). Ephemerides (for the geocenter) generated using the "Minor Planet Ephemeris Service" for the period November 2013 - December 2014. A word of caution: as always with comets, the future magnitudes reported here are only indicative at this stage. Next weeks will tell us something more about the future of this promising comet. "This morning (9/10/2012) at 11:35:30 UT, I observed a bright white two second long explosion just inside Jupiter's eastern limb, located at about Longitude 1 = 335, and Latitude = + 12 degrees north, inside the southern edge of the NEB. I used my Meade 12" LX200 GPS telescope and a binoviewer working at 400X for the observation, seeing was very good at the time." Another amateur astronomer, George Hall of Dallas, Texas, was video-recording Jupiter at the time, and he confirmed the fireball. The video was captured with a 12" LX200GPS, 3x Televue Barlow, and Point Grey Flea 3 camera. Click on the image below for a bigger version. Hall also posted online a short clip of the impact video (see below). It is possible that the flash was caused by a meteor or small asteroid/comet hitting Jupiter. This is the sixth time that we have seen something slam into Jupiter, beginning with a fireball recorded by Voyager 1 as it flew past in 1979 and the famous impact of Comet Shoemaker-Levy 9 in 1994. The more recent cases are that of July 19, 2009 (discovered by Anthony Wesley), of June 03, 2010 (discovered by Anthony Wesley and Christopher Go) and of August 20, 2010 (discovered by Masayuki Tachikawa & Aoki Kazuo). "It has long been assumed that the giant planet Jupiter acts as a shield, significantly lowering the impact rate on the Earth from both cometary and asteroidal bodies. Such shielding, it is claimed, enabled the development and evolution of life in a collisional environment which is not overly hostile. The reduced frequency of impacts, and of related mass extinctions, would have allowed life the time to thrive, where it would otherwise have been suppressed. However, in the past, little work has been carried out to examine the validity of this idea. Our results show that the situation is far less clear cut that has previously been assumed - for example, the presence of a giant planet can act to enhance the impact rate of asteroids on the Earth significantly." Once again amateur astronomers have shown their ability in monitoring almost permanently the planet Jupiter. On September 11, 2012 Astronomer Mike Wong was able to analyze the video data of the flash kindly provided by George Hall. According to his analysis he made the prediction that "this event is too small to create a visible impact scar". Several observers have imaged the planet Jupiter on the second and third rotations after the fireball and nothing new has been detected at the impact site. So the total energy seems to have been low and "we can conclude that the flash was most likely a meteor due to a small (diameter < 10m assuming a density of 2 g/cc) meteoroid". M.P.E.C. 2012-Q25, issued on 2012 Aug. 20, reports the discovery of the asteroid 2012 QC8 (discovery magnitude 17.1) by Siding Spring Survey on images taken on August 19.6 with a 0.5-m Uppsala Schmidt + CCD. 2012 QC8 has an estimated size of 670 m - 1.5 km (H=18.0) and it will have a close approach with Earth at about 22.7 LD (Lunar Distances) or 0.0583 AU at 2256 UT on 14 Sept. 2012. This asteroid will reach an average magnitude of 14.6 around September 10-13. 2012 QC8 is a current radar target for ground based radio telescopes. 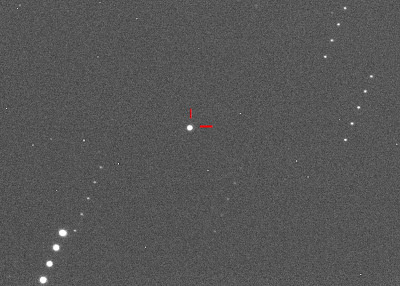 We performed some follow-up measurements of this object, remotely from the Siding Spring-Faulkes Telescope South on 2012, September 10.4, through a 2.0-m f/10.0 Ritchey-Chretien + CCD. 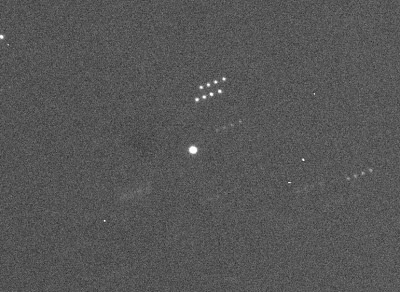 Below you can see our image, stack of 5x5-second exposures, taken with the asteroid at magnitude ~14.6 and moving at 16.15"/min. At the moment of the close approach on 14 September, 2012 QC8 will move at ~ 29"/min. 2012 QG42 has an estimated size of 200 m - 500 m (H=20.4) and it will have a close approach with Earth at about 7.43 LD (Lunar Distances) or 0.019 AU at 0510 UT on 14 Sept. 2012. This asteroid will reach an average magnitude of 13.6 around September 10-12. 2012 QG42 is a current radar target for ground based radio telescopes. Astronomers at Goldstone and Arecibo will try to observe it on September as "this object should be a really strong delay-Doppler imaging target". It was classified as a PHA ((Potentially Hazardous Asteroid). PHA are asteroids larger than approximately 100m that can come closer to Earth than 0.05 AU. None of the known PHAs is on a collision course with our planet, although astronomers are finding new ones all the time. 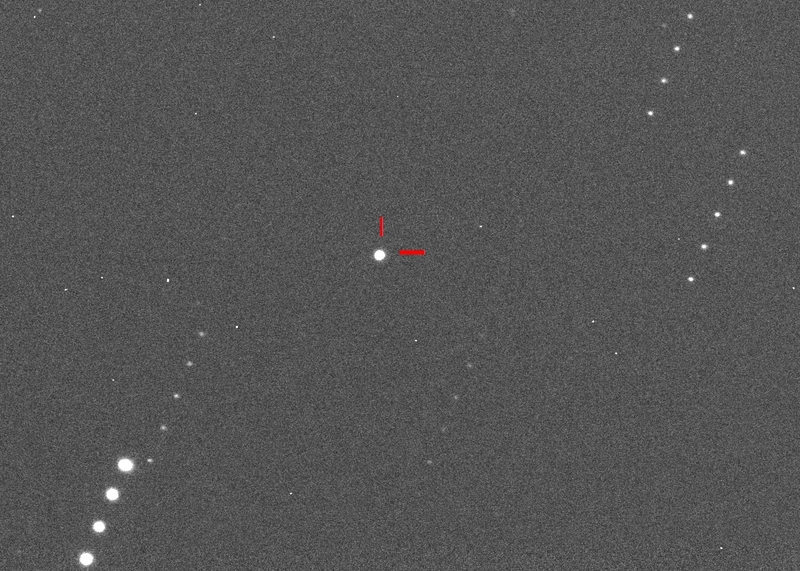 We performed some follow-up measurements of this object, remotely from the Siding Spring-Faulkes Telescope South on 2012, September 04.5, through a 2.0-m f/10.0 Ritchey-Chretien + CCD. 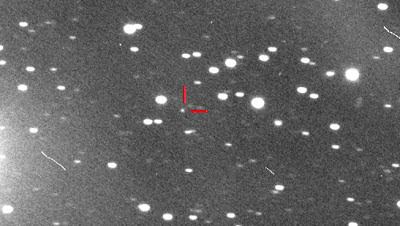 Below you can see our image, stack of 4x10-second exposures, taken with the asteroid at magnitude ~15.2 and moving at 4.35"/min. At the moment of the close approach on 14 September, 2012 QG42 will move at ~ 49"/min. "Critter is still observable but the phase angle is now around 70° whereas most of the data are from < 20°. The amplitude and shape of the curve may be evolving and so it becomes more and more difficult to merge all the data into a single set. Ideally, a data set taken over the next 24 hours from stations widely-separated in longitude would be treated as "stand alone" and would help with modeling - LOTS!" Below you can see the plot of the current photometry for 2012 QG42. It reveals this PHA rotates once every 24.278 hours, or 24 hours, 16 minutes, 40.8 seconds. (click on the image for a bigger version). "We spent most of our time during the track improving the orbit by estimating Doppler and ranging corrections to the ephemerides. The radar data are consistent with a slow rotation period as inferred from the lightcurves reported by Brian Warner. We have one more track scheduled at Goldstone on Sep. 15 and four tracks at Arecibo on Sep. 14-17."